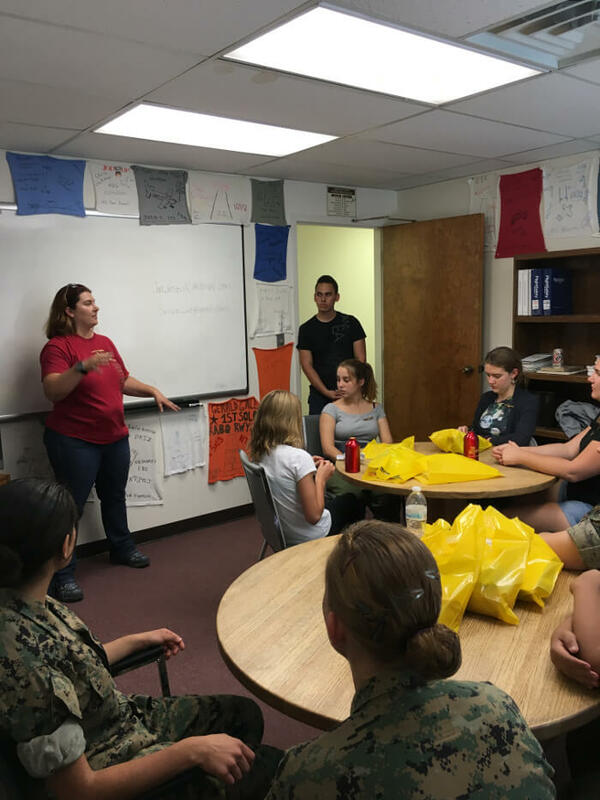 This past weekend I had the opportunity to share my love of aviation with a small group of young women. 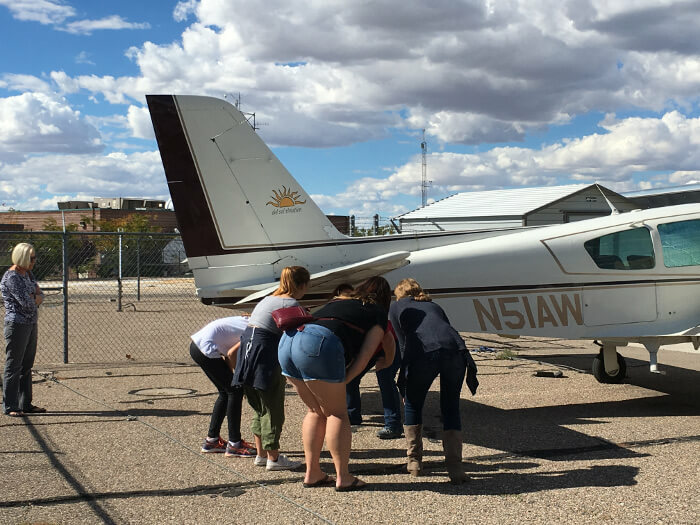 A junior in High School reached out to Del Sol Aviation wanting to put together a joy of aviation seminar for her Girl Scout gold badge. I have never been one to turn down the Girl Scouts. Or miss an opportunity to talk aviation with anyone willing to listen. So I jumped at the call when I was asked to speak to these young women as a female pilot. We had 8 young ladies join us for this event. Most were in high school, but a few were still in middle school. We even had a few MCJROTC girls. A great age for them to be introduced to what’s possible for them! The first segment of the afternoon was a fuel truck and marshaling demonstration from the wonderful people at Cutter Aviation. 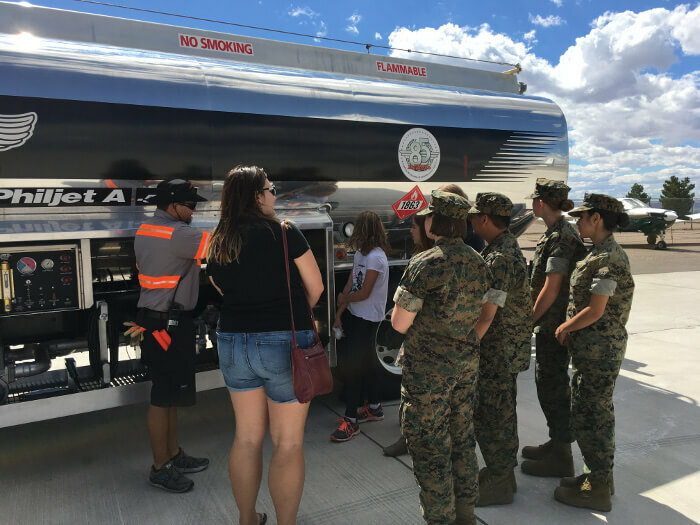 Joel showed the girls the operations of the fuel truck by re-circulating fuel. This allowed them to feel the pumping of the avgas. The they were showed how to direct a plane to a parking spot. Using the illuminated beacons the participants were able to marshal Joel, as a simulated plane, to park. 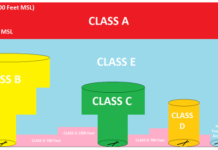 Ground crews don’t have the ‘prestige’ that a pilot does, but don’t underestimate this position. Without them, pilots aren’t going to get very far. They fuel our planes, move them in and out of the hangars and help to ensure we park safely when we land. They are certainly appreciated by this pilot. 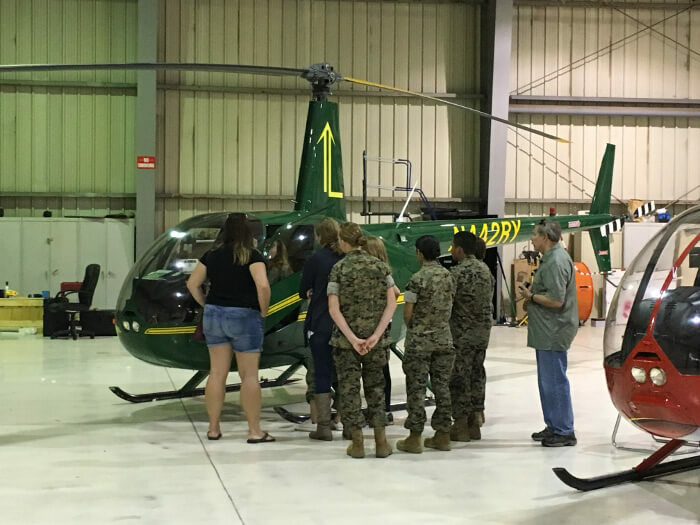 After the operations outside we moved back into the hangar and the girls were introduced to a female helicopter pilot, Allison from Vertical Limit. They were shown the basic movements and considerations of piloting a helicopter before they were given some great photo ops in the beautiful Robinson R-44. There are some great helicopter jobs out there that are actively looking for not only great pilots, but great female pilots too. Getting your helicopter license is the first step in such careers as news choppers, EMT pilots and many military applications. Back in the classroom I took over and we discussed being a pilot. Joined by one of Del Sol’s own, Cameron, an almost CFI, we talked about pilot safety and why keeping it in the forefront is important. 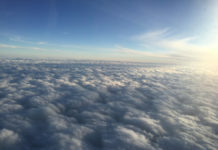 I discussed basic weather and how it can effect the plane and your flight. We also talked about what it takes to become a pilot and ways they can reduce the burden of cost through home study, scholarships and the military. There were some great questions asked about flying into different countries and how do pilots from all over the world communicate with each other. The ladies were engaged and I had fun spending time with them. Moreover, I was even able to get the parents in the room to ask some questions. We finished by touching on the importance of women in aviation and how it is a great time to get involved in flying. Lastly, we moved back outside and did a sample walk around of a twin engine. In the interest of time we split the group up and “pre-flighted” one side of the plane per group. The ladies were given the chance to touch the plane, move parts and get one last taste of what a pilot does while still on the ground. Due to other circumstances we were not able to provide flights for this small group. 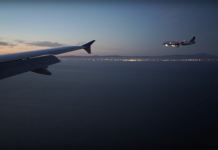 However, we encouraged them to visit one of the many events that offer free flights. 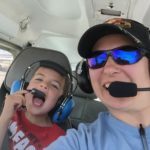 From the EAA young eagles program to women of aviation week there will be plenty of opportunities to experience flight in a small general aviation plane. 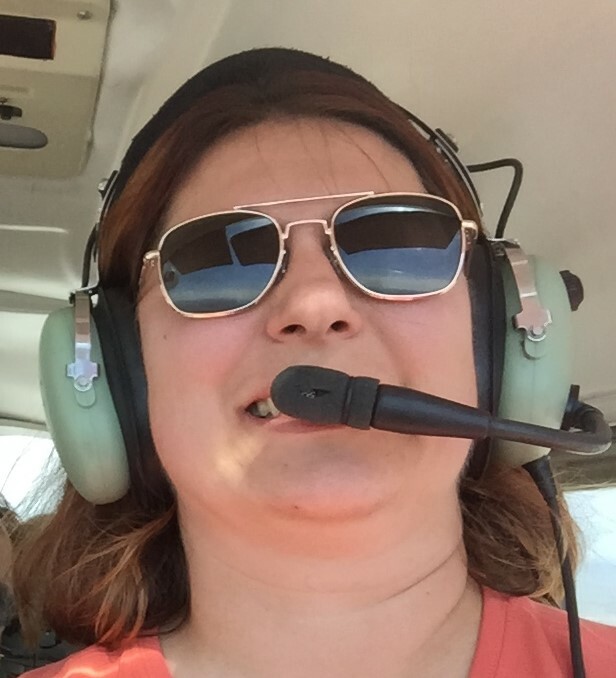 While it is always a blast to give someone their first general aviation flight I really enjoyed talking about it. Giving young people, especially women, the pure joy of aviation in many facets is a passion I have discovered recently. 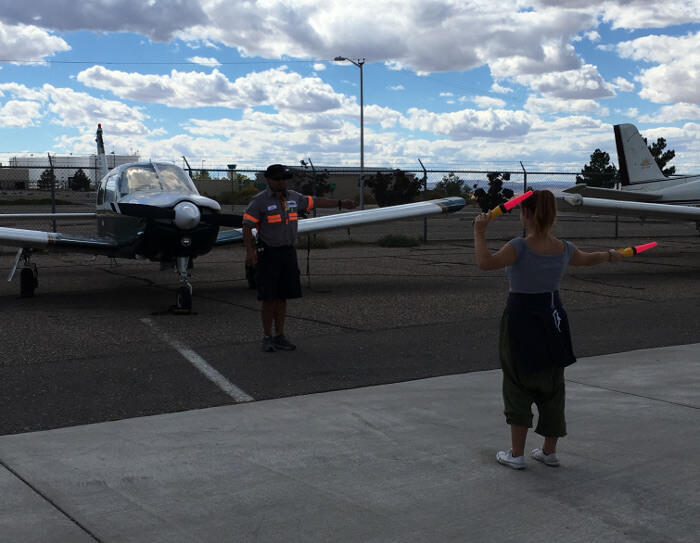 It was a fun couple hours on Saturday and a great mini test run for the Women of Aviation Week that Del Sol will host in March of 2017. I am always amazed at how easy it is to be infectious about something you are passionate about. Also, it’s events like these that help me to solidify what I know. It also helps to find areas where I need to learn more. A big thanks to everyone involved who made this event happen. A special big thank you to the young woman who worked to put this event together. I look forward to seeing all the wonderful things you will accomplish in your life.